There are two very different versions of Toc Toc Woodman, and also a third edition named Click Clack Lumberjack which makes minor additions to the second edition of Toc Toc Woodman. 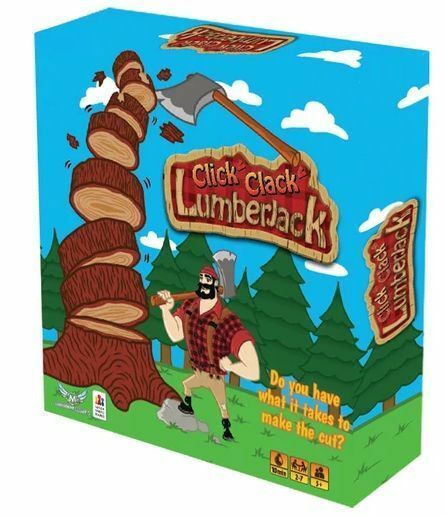 In each version, the object of the game revolves around using a plastic axe to tap a tree made out of individual flat segments without causing any segments to fall out of the tree. A very simple dexterity game with 12 large wooden discs, a wooden axe, and a die. The discs are stacked as a tower. A player turn consists of rolling the die and then hitting the tower with the axe. For example, if you roll a five, you have to hit the fifth disc five times with the axe. The player causing the tower to fall loses. Very similar to Toc Toc Woodman Second edition, but adds some optional grub stickers which you may apply to bark pieces in order to add various rules for the grub. Also comes in smaller, more portable packaging and at a lower price point.